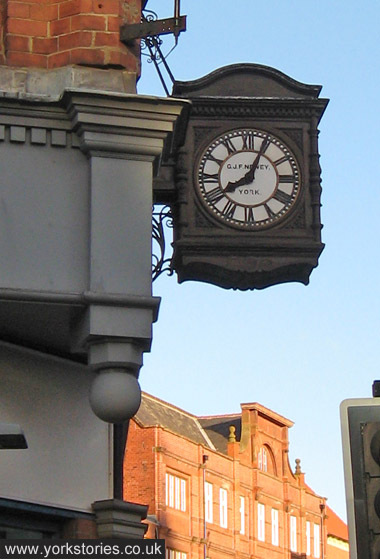 This is the only city centre clock I remember finding particularly useful when younger, not for its time-telling necessarily but because it was an easily recognisable landmark and so often used as a meeting point. In the busy city centre, whether you were meeting a fellow resident or someone less familiar with the place, arranging to ‘meet under the Marks and Spencer’s clock’ always meant you found one another. Though as it was so popular, there were often quite a few people standing about under the clock, so it didn’t work so well if you didn’t know what the person you were meeting looked like. I don’t know if it still serves that purpose. 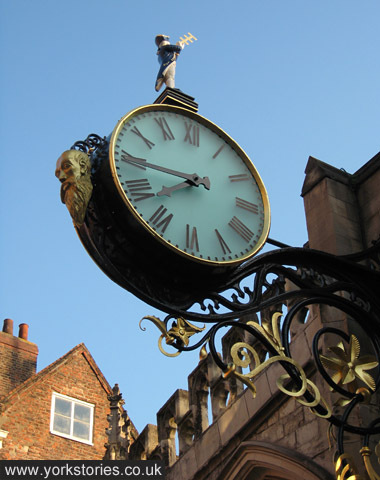 Perhaps the person pictured is on his way to meet someone for an evening out, beginning at the M&S clock, at 7.30pm. In which case he’s a reliable type, as he’s a bit early. Nearly 7.30pm, on Blossom Street. The Bar Convent, handsome, classical and calm, its clock quietly keeping time, its handsome frontage looking over at the young upstart, the new kid on the block, the Premier Inn building with its broken clock, once Forsselius. The previous page mentioned the multi-faced Forsselius clock, which after about 80 years seems to have given up on accurate time-telling. No matter, as across the road the convent clock is reliably ticking over. 7.40pm, De Grey Rooms, Exhibition Square. 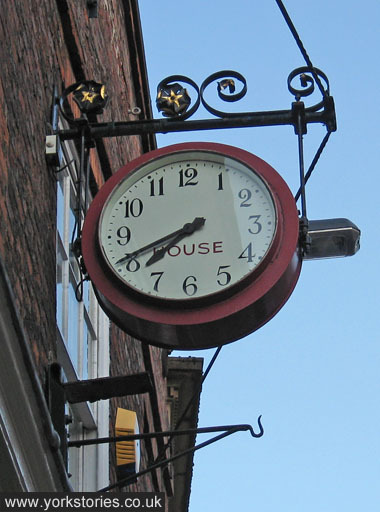 This one I pass all the time, and it’s now to me York’s most useful public clock, the one I look at when dashing in to town to meet someone, as my timekeeping is rubbish and I’m almost always late, and casting anxious or perhaps panicky glances towards it. It’s a handsome thing, isn’t it, on its ornate iron bracket, near those equally elegant balcony railings. A thing of beauty, keeping time beautifully. A good example of how taking photos makes you take more notice. Though I do sometimes look at this clock I’ve only just noticed that it carries a small reminder of a business based here on Blake Street for many years. House & Son, electricals. They left these premises about a decade ago, but left behind a reliable timepiece to remind us of their time here. A small consolation for those of us who still quite miss the old painted sign with the hand pointing to the shop door. This one, the ‘admiral clock’ is of course well-known and widely admired. It’s massive, and so prominent that it would be a shame if it didn’t function properly. It was restored recently and is looking very smart, with the admiral figure on the top looking up into the evening sun as I passed by. There’s detailed and interesting information on the clock, previous clocks, and the wonderful ‘little admiral’ figure on the St Martin’s church website. On the corner, on what I think must have been the Co-op building, a clock with the maker’s name displayed prominently on the face. G J P Newey made this clock, presumably in the late 19th century or early 20th century. 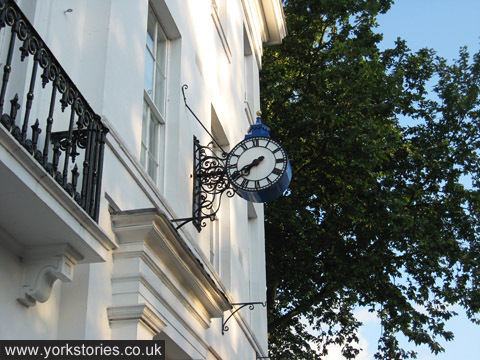 Again, I’d never really paid much attention to the lettering, but now I have it’s led me to this nice article about a descendant, Geoff Newey, and his many years of service looking after many of the city’s clocks. I noticed this clock when I stopped to watch morris dancers here in the square one evening in May. Normally I’m too intent on getting in through the doors of Barnitts to buy various essential items to pay much attention to what’s above. This very handsome clock, designed by the architect Tom Adams, is watched over by one of his trademark black cats. 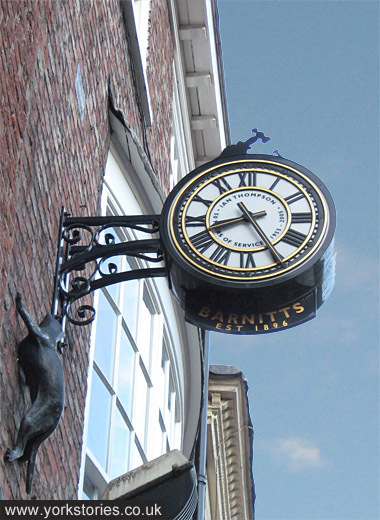 It’s perhaps not so common now for businesses to provide a public clock on the front of their buildings, but it seems right that Barnitts should have one, as they’ve been around for so long in York — since 1896, says the lettering under the clock. 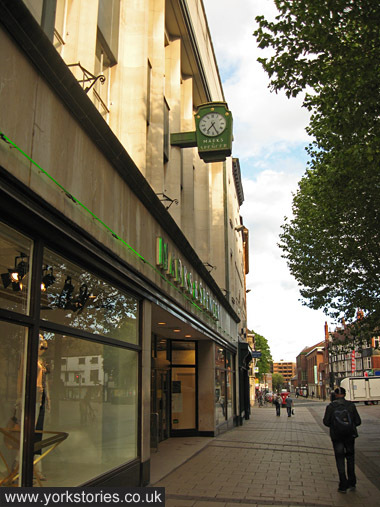 The lettering on the clock face itself marks Ian Thompson’s 50 years of service, from 1955 to 2005. 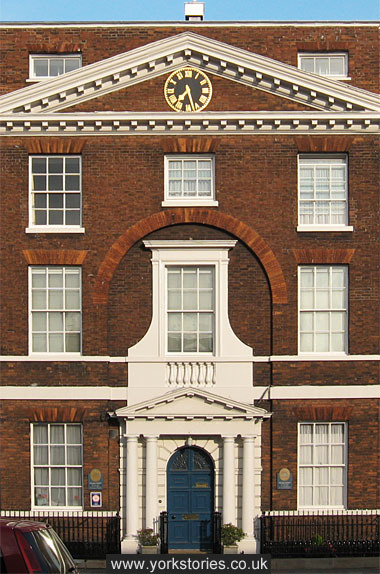 Our York clocks have taken us through one nicely rounded period of time, one evening hour, from 7.25pm to 8.25pm. This is merely happy accident, as actually these photos were taken on several different evenings, which explains how I got from Parliament Street to Blossom Street in about three minutes. Time to sit down awhile, maybe watch some morris dancing, while the Barnitts clock quietly keeps time behind us. While compiling these pages about clocks, songs about time and clocks keep coming to mind. Previously, that Cyndi Lauper song, Time after Time, from the 80s. While writing this page, it’s been songs by Nick Drake. At the Chime of a City Clock, and Time has Told Me. Nothing to do with York, just something I wanted to share, everyone who’s not heard them before should have a listen. Genius he was.